L'objet est en voie de restauration. The fan is in the process of being restored. My dad and his friend who is expert of ancient Chinese poem have got the poem interpreted. He also sent the interpretation to uncle Daquan for further update. The writer's name was Zhang Zi-Yin. My mom said that this is a female name and she's very possible a sister of my grandfather Zhang Zi-Hou. As known, the same first character of given name, Zi, meant that they were brother or sister in the family. 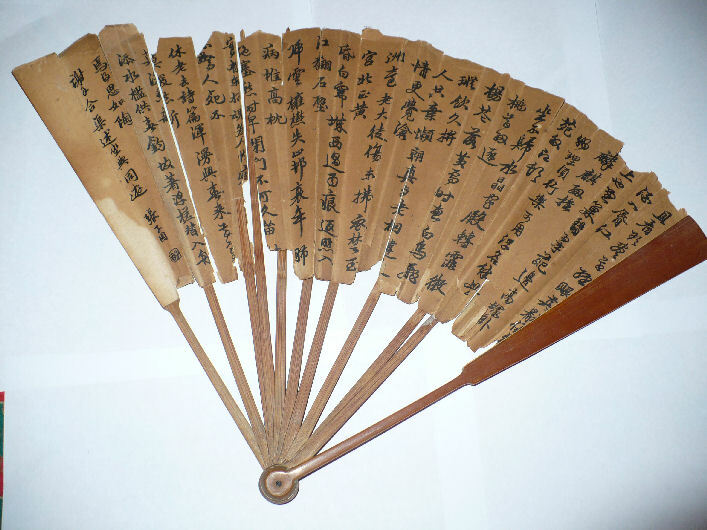 The poem on the fan combined the four poems of famous poet Du Fu （ A.D. 712--770 ） in Tang Dynasty. Ziyin wrote the poem to express her homesick feeling. It is hard for me to translate these into English. But if you need to know these in English, please just let me know and I will be pleased to find someone's help. I also searched the four original Du Fu's poems on line and attached them here. Anne Splingaerd Megowan ayant sollicité plusieurs personnes dans le but de trouver une traduction du poême, ce travail fut réalisé par Madame Xing Liu et son oncle Zhan Da Quan. Voici la correspondance échangée et les documents. Merci à tous. Anne Splingaerd Megowan several people who have applied in order to find a translation of the poem, this work was done by Liu Xing and his uncle Da Zhan Quan. Here is the correspondence and documents. Thank you all. Subject: More information of the fan? I am very glad to see the two letters you sent to me. I want know if my cousin has seen the photos about the items left by aunt Anna. Hope that the photo can bring him some good memories of childhood. Ane, do you know what it is in the back side of the fan? Normally, one side of the fan should be painting and another side should be inscription. The paint normally inscribed with the name of painter and date. If you can provide these information, it will be more helpful for us to learn more of the fan. About how zhang met Lin, it is very normal because there were not so big populations at that time, and the ancient house were more less. Another reason should also owe to the church. But aunt Anna and uncle maybe celebrated their wedding in Beijing or in Tianjin, because aunt Anna was sent to Beijing for study when she was teenage. Hope that you can get to know more relatives and have more gains when you are in Belgium for the reunion. Now myriads whirl in wind as many woes of mine. And to the full indulge in cups and cups of wine. Stone unicorns lie sideways on a lofty tomb. Why care for empty fame, with all my life in gloom?